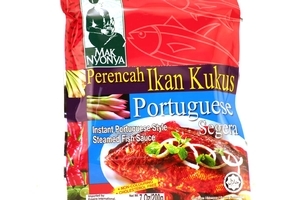 Mak Nyonya Instant Portuguese Style Steamed Fish Sauce Mix (Perencah Ikan Kukus Portuguese) in 7oz (200g) sachet. Maknyonya is proud to present, a simplicity in cooking, an easy to present, convenient, tasty as well as delicious in collections of Nyonya sauces. It is the most relaxing way to preparing an easy-to-cook Nyonya delicacy to fill up your family members under the warm environment to enjoy a flavored unique Nyonya food. Product of Malaysia. No Coloring ۾∞ | Cholesterol Free Θ | Halal Certified حلال . Members of this community in Melaka address themselves as Nyonya Baba instead of Baba-Nyonya. Nyonya is the term for the ladies and Baba for the gentlemen. It applies especially to the ethnic Chinese populations of the British Straits Settlements of Malaya and the Dutch-controlled island of Java and other locations, who have adopted partially or in full Nusantara customs to be somewhat assimilated into the local communities. onion, lemongrass, chilli, torch ginger, sugar, salt & palm oil.